This is a brief study guide for the Physical Science Unit 1 test. To view all the posts covered in Physical Science Unit 1, use the “category” selector in the left hand column (below the posts in mobile devices) and select Physical Science Unit 1. How to derive the General Equation of Kinematics and how to derive the ‘time independent’ equation of kinematics using the 2 column derivation method. 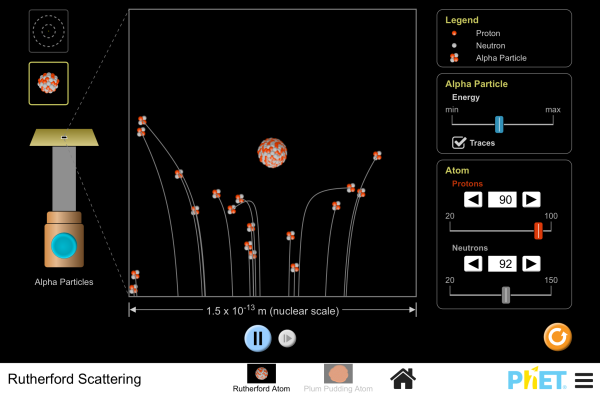 Warm Up: Sketch the Plum Pudding, Rutherford, and Bohr models of the atom. Where Oh Where – did all these atoms come from? All the atoms we have today were created as a result of the Big Bang in the early days of the universe. As the Early Universe cooled, protons and electrons formed and joined together to form Hydrogen atoms. Later, stars formed and “burned” the Hydrogen producing Helium. Larger, hotter stars continued to burn the Helium to produce heavier atoms such as Iron and Magnesium, then exploded, spewing meals (iron, magnesium etc) across the universe. These metals together with Hydrogen and Helium are the materials which stars, planets, and galaxies are made of. How did we come up with today’s models of the atom? It all started with Democritus. Democritus was a great and wise Greek philosopher who lived from 460 BC to 370 BC. Plato hated him but Democritus had a great sense of humor which undoubtedly irritated the serious Plato (428 BC – 328 BC) even more. He went blind in his old age and lived till 90, although some historians believed he lived to 109! Most of his writings were destroyed in th middle ages so his life has become filled with legend. Democritus’ theory of atoms started as a thought experiment. He (in discussion with Leartus) said if you divide a grape in half and in half again and keep dividing it, eventually you will reach the point where you can divide it no more. He called these smallest possible pieces “atoms” which meant indivisible in ancient greek. He also believed there was empty space or “void” between the atoms. Later Aristotle, (384 BC-322 BC) disagreed with Democritus’ theory since he knew that nature could not allow a “void”. Aristotle believed that matter was made from the 4 elements of the ancients; earth, air, water, and fire. Today we know that Democritus was closer to the truth than Aristotle. The problem was, Aristotle was so famous that everyone believed him, setting science back 1,000 years. By the 1700’s, scientists had figured out that there were 2 kinds of electric charge. Opposite charges attracted one another. Like charges repelled. Benjamin Franklin, one of our nations founding fathers, was fascinated by these electric charges. He deemed he could capture the power of electric lightning by flying a kite with a metal key on the string. He was right, and the result was shocking! Benjamin Franklin was the first to name the opposite charges plus +, andfather-time.jpeg minus -. He also invented the lightning rod. In 1803, John Dalton, extended the ideas of Democritus. Dalton reasoned that all atoms of a specific element were identical and in some way different from the atoms of other elements. In the late 1800’s scientists were busy trying to understand the structure of atoms. In 1897, J.J. Thomson, using cathode ray tubes, identified the electron. Thomson went on to propose a model of the atom called the Plum Pudding model. He pictured the atom as being a ball of positive charge with negative electrons stuck in it, the electrons being much like the pieces of plum in plum pudding, a popular British desert. In 1911, Ernest Rutherford designed an experiment using a thin gold foil and a beam of Alpha Particles (Helium nuclei). Rutherford was hoping to confirm Thomson’s model. He expected the beam of Alphas to pass through the gold with only minor spreading of the beam. What he found instead was that some of the Alpha particles were “scattered” through wide angles, some even bounced straight back. This set the scientific community on its head and they soon discarded the now stale plum pudding model. In atomic physics, the Rutherford–Bohr model or Bohr model, introduced by Niels Bohr in 1913, depicts the atom as a small, positively charged nucleus surrounded by electrons that travel in circular orbits around the nucleus—similar in structure to the solar system, but with attraction provided by electrostatic forces rather than gravity. Bohr defined the “orbitals” as having primary quantum numbers n = 1, 2, 3, etc. Looking back to the spectral lines we saw in the gas discharge tube demonstration, we see that electrons were excited to a higher n quantum level by the power supply. Then the electrons returned to their ground state by releasing energy in form of “photons of light” where the photon energy or color can only have specific values (colors). Assessment: Why do different elements have different emission spectra?